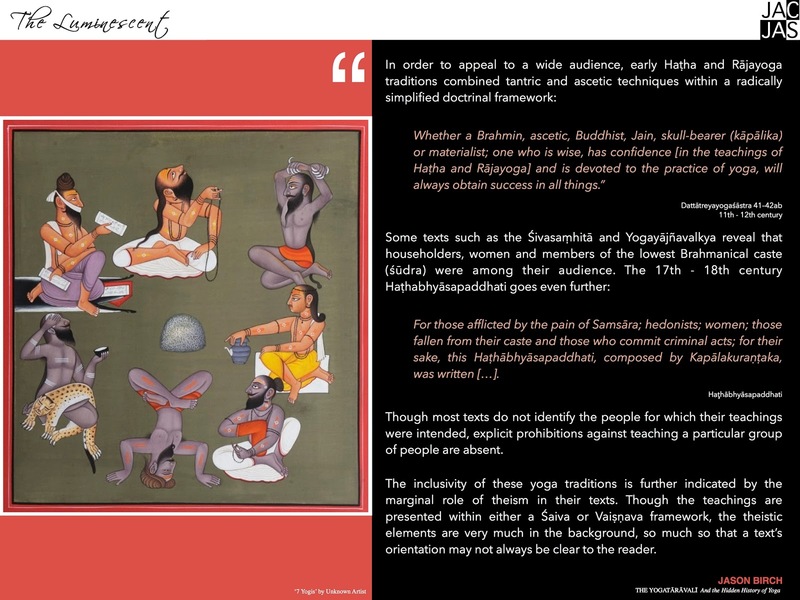 What is quite fascinating about the way Yoga texts were written and compiled in medieval India is that they often provide systemised hierarchical methods for achieving a goal or series of goals. Not unlike the brief self improvement lists that circulate widely on social media today, such as '10 ways to authentic happiness' or '7 tips for staying young'. "...it refers to the body, or rather the person, since the techniques taught by Gheraṇḍa work on both the body and mind." The text focuses on the physical techniques that need to be practised in order to perfect both the body and mind to achieve it's goal, Rājayoga (a synonym for samādhi). Like most other Haṭhayoga systems, the seven practices in the Gheraṇḍa Saṃhitā do not contain ethical guidelines, such as those instructed in the yamas and niyamas of the Pātañjalayogaśāstra. Interestingly, however, the Gheraṇḍa Saṃhitā does provide a unique set of six techniques for attaining particular types of samādhi, the state of meditative absorption that is liberation. 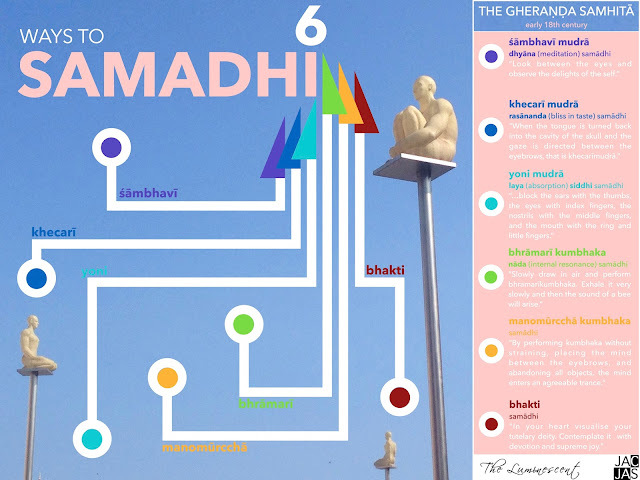 In most Haṭha and Rājayoga traditions, meditation techniques such as Śāmbhavī and Khecarī Mudrās are prominent for achieving samādhi and these techniques feature in the Gheraṇḍa Saṃhitā. However, the Gheraṇḍa Saṃhitā also includes Yoni Mudrā, two prāṇāyāma (breath retention) techniques and Bhakti (devotion) in its sixfold system of Rājayoga. The Gheraṇḍa Saṃhitā teaches ten prāṇāyāma techniques, so why does it single out Bhrāmarī and Manomūrccha for inclusion in its sixfold system of Rājayoga (samādhi)? If one successfully practises each technique in the sixfold system to achieve samādhi, are the other techniques in the earlier chapters (i.e., the ṣaṭkarma, āsana, etc.) made redundant? Why is Bhakti included as a means to achieving samādhi when it largely absent in Haṭha and Rājayoga systems before this time? The first four of the six techniques of Rājayoga produce specified qualities or types of samādhi, that is to say Dhyāna, Rasānanda, Layasiddhi samādhi and Nāda respectively. Why are different types of samādhi not specified for the other two techniques, Manomūrccha and Bhakti? Different types of samādhi are included within Pātañjalayogaśāstra tradition, but levels and types of samādhi are altogether absent from the Haṭha and Rājayoga traditions. Is this system the only late medieval yoga text to refer to different types of samādhi? Mallinson has published an English translation of the Gheraṇḍa Saṃhitā along with an informative introduction that provides the important context necessary for understanding some of its teachings. We are very pleased to announce a five year research project funded by the European Research Council, led by Dr Dagmar Wujastyk and team members Dr Suzanne Newcombe and Dr Jason Birch, will commence at the University of Vienna in June, 2015. 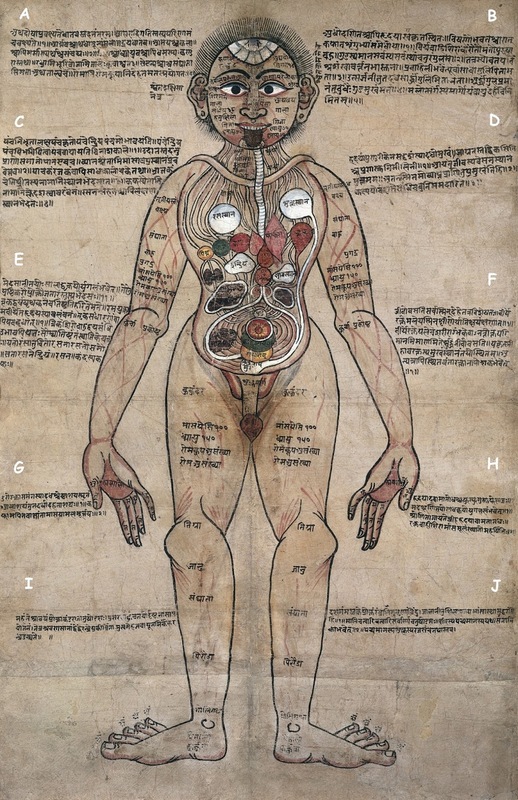 The project will examine the histories of yoga, ayurveda and rasaśāstra (Indian alchemy and iatrochemistry) from the 8th century to the present, focussing on the disciplines' health, rejuvenation and longevity practices. The project will aim to generate new knowledge of the history of these disciplines by providing access to previously untranslated works, analysis of their contents and a study of how these disciplines link to the present forms of these traditions. 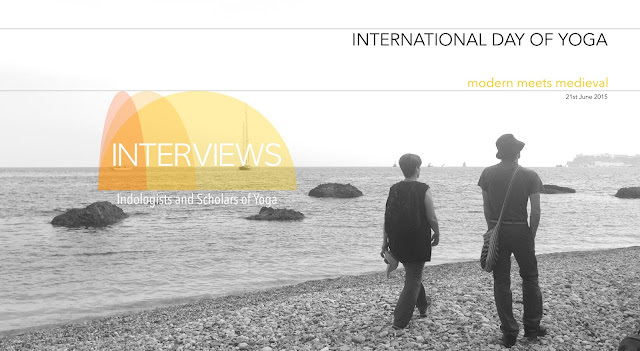 Outputs will include journal articles, monographs and an international conference.